Tonight I'm drinking Narragansett Porter brewed by Narragansett Brewing Company in Rochester, New York. According to the story on the back of the 16 ounce can, which starts with "Hi-Neighbor! 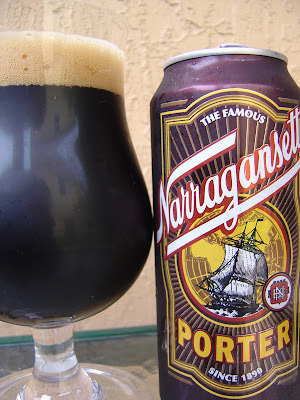 ", some of the old-timers call this 'Gansett Dark. 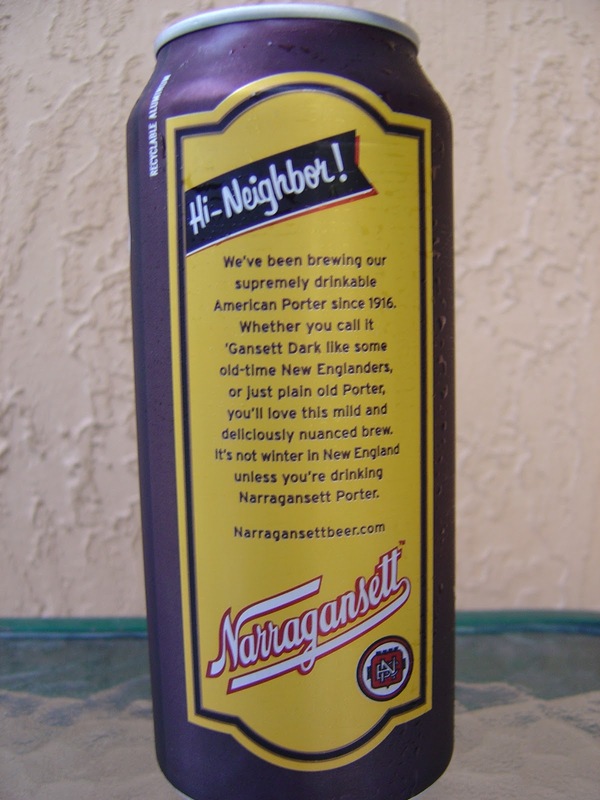 Apparently, "it's not winter in New England unless you're drinking Narragansett Porter". To that statement I will say (with a for sure backing of every Bostonite this year), "Wanna bet?" These guys have been brewing this beer since 1916 so it must be pretty good. "Supremely drinkable" seems like something that I would say about a beer, but as an underhanded compliment. But that's what these guys say about their beer. Let's see. Roasted malts with a very nutty aroma. Roasted and malty flavors to start as well; however, now there is quite a large dose of chocolaty goodness and the nutty aspect is way off in the background. After the initial sweetness, some harsh bitterness comes in the form of a lemony hoppy bite. Very rough carbonation makes that bitter wash seem even worse. The beer never really recovers from that as you finish with a dry and astringent unpleasant finish. Sorry, but I didn't finish it. It's not that I couldn't finish it. I just didn't feel guilty for dumping it because the price was pretty cheap. Not horrible but not a winner for me. 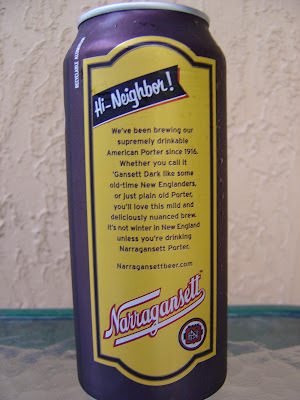 Somehow I doubt if "these guys" have been brewing Gansett Dark since 1916. The label has been through several owners, and the original brewery closed in 1983. As for the other claim, I've lived in New England 20 years, have yet to even see the beer, and I can attest to plenty of winter! Thanks for setting the record straight. I'm pretty sure you are absolutely correct!